As a prolific networker, and the owner of my very own banner stand, I am partial to a talk here and there. Occasionally, I approach people and sometimes (happily) individuals come to me. Which is lovely. However, the more I speak at various events around London, and Israel, the more I am learning that not everyone seems to know how to treat speakers. So to those individuals, who to be frank, have rather ruined my day with their behaviour, here is a handy reminder about treating guest speakers with respect. I have dragged myself, my laptop and my banner stand from Finchley to your lovely location. And, whilst don’t get me wrong, I appreciate this is a marketing opportunity for myself, I am also providing free content to your audience. So when I arrive at your premises with no clue of where to go or who to speak to, it’s a little distressing. Not least because I’m carrying significant physical weight in my hands, which is fine when I’m in my gym clothes, less so when I’m in my favourite dress and carefully applied makeup. Instructions such as “room 5K” (true story) honestly mean nothing to me. Please, I beseech you, have someone meet me, or, at the very least, properly explain yourself. Whilst I don’t expect a three course gastronomical tour of Italy (although boy would that be nice..) it really is the simple things. Water, when talking, is absolutely essential because otherwise my throat gets parched and it becomes mightily difficult to talk. More than that…if I have told you I have a MacBook with a beautiful presentation within its server please do ensure you have the right cable. Or tell me to bring a USB. Or print it off. Really anything will do…. On a number of occasions recently I have attended talks and no-one has turned up, or very very few people. Now I completely understand that organising an event is tremendously difficult and things don’t always go to plan. However, why not tell me? Listen….no-one is going to turn up, maybe let’s call it off? Or even an honest…it’s too late to cancel, but don’t get your hopes up on this one H. But, no. Nothing. As in all things I genuinely do believe that honesty is the best policy. To be fair, this possibly isn’t the most important on the list. However, let’s be honest the social media followers love a good photo of me with the banner stand. So please offer to take a photo, or if you are not the photo taking type, enlist one of your colleagues. It just saves me the embarrassment of sounding like a vain son? of a gun, which, in truth I am, but is rather beside the point. Once after giving a talk I received a personalised, hand-written note? which genuinely meant a tremendous amount. However, aside from this exceptional occasion, never, after giving a talk have I received a thank you, which makes me a little sad. I just think it’s the polite thing to do. Once I reached out to the organiser to thank her and she simply didn’t reply. Which, genuinely, surprised me. Honestly, an email would make my day. In life, it really is the little things. 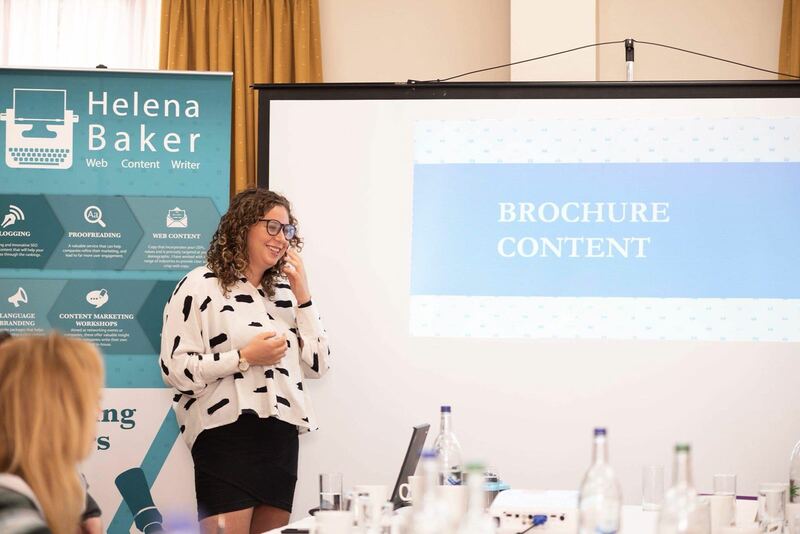 If you would like me to give a content marketing talk either in London or Israel (my two bases), please do feel free to drop me an email on helena@helenabaker.com or give me a call on 07826 857 882. Alongside speaking at length on all things content marketing, I also write blogs, website content and brochures; all of which you can learn more about on my lovely website here.